Pam and I are privileged to work and live among some really exceptional people. The staff at Taylor’s that I teach with have to be some of the most educated and talented people I have ever worked with. Most of them have Master’s degrees in education, or are working on getting one, have loads of teachable subjects like drama and music, political science and law, and personal interests that include kayaking, photography, diving and wilderness trekking. Most of them have taught internationally as well, in Dubai and England, China, Korea and Thailand. They are young, personable, friendly and adventurous and have talent up the wazoo. The kids I teach are a pretty talented lot as well! Some of that talent was on display last night at the Canadian Program’s Talent Show. There were singers and dancers, comedians and magicians, bands and solo acts. The energy level in the lecture theatre was through the roof, and near impossible to contain; every act was greeted with wild cheers of appreciation. The organizers, Randy and Eileen, had wisely allowed the kids to largely run the show themselves, and it was a low budget, no frills affair with the minimum of sound equipment, lighting and stage props; probably the least amount of preparation in that area of anything we have done since I’ve been here. But rather that diminish the effectiveness, it really let the talent of the kids shine thorough in all its raw enthusiasm and ability. The singers were sweet; the band was amazingly talented; the MCs were funny; and the stand-up comedian, Ern, got in some good licks about the teachers, myself included. 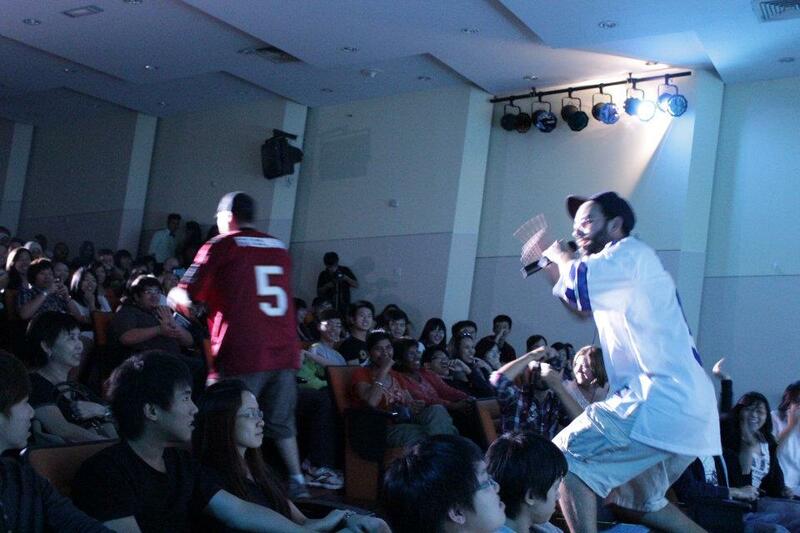 But the highlight of the show had to be the faux ‘rap battle.’ Three of the young English teachers put this together. There was a DJ/moderator, Dan Layng who introduced the ‘battle’ and laid down the beat with an awesome self-voiced rhythm/sound track into the microphone. Then he introduced the ‘east coast’ sound of another colleague, Colin Boucher who did a very clever interpretation of an Eminem rap with local references and colour. The kids just went wild! He was then ‘confronted’ by another English teacher, ‘Drey,’ who did a gangsta-style rap also filled with local references and personal ‘attacks’ on his rival. With his raucous style and aggressive attitude the kids were just squealing with delight. This went on for several bouts with very inventive lyrics and complicated rhythms, before they ‘reconciled’ their differences. It was seriously impressive stuff and established these guys reputation around this place for years to come! Following the show the kids hung around for hours, just chatting happily to themselves and hugging the performers and the stage crew and everyone else involved. Events such as this are what binds a school cohort together and gives the students happy memories of their education that empower their studies. Everyone’s morale gets boosted and students learn to see their teachers in a whole new light; as fellow travellers on the road to betterment, rather than the antagonistic master/slave relationship they have endured for so many years in the Asian school system. It is a revelation to them, and a turning point in their understanding of what education can do for them. We are so happy to be a part of that.